Manhattan, NY CTA Architects P.C. 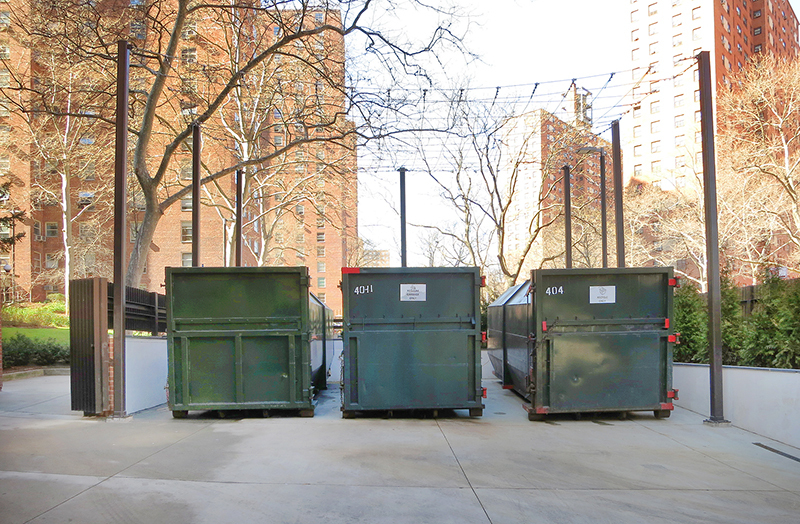 (CTA) has completed the $1.1 million redevelopment and upgrade of the 5,650 s/f refuse storage area at Morningside Gardens, a six-building co-op complex in West Harlem’s Morningside Heights section. Morningside Gardens features 980 apartments housing many of New York City’s professionals, including Columbia University and Barnard College employees. 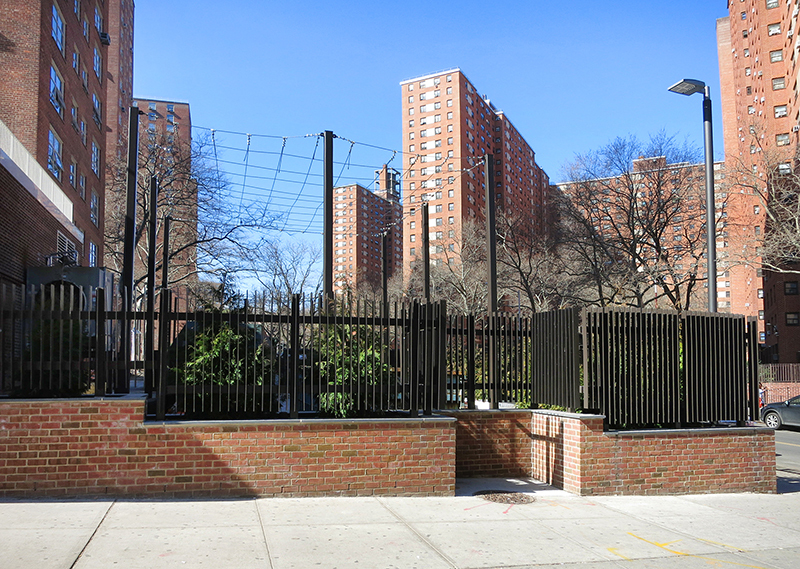 CTA had previously served the client, Morningside Heights Housing Corporation (MHHC), as the architect for the $10 million exterior restoration of the complex. 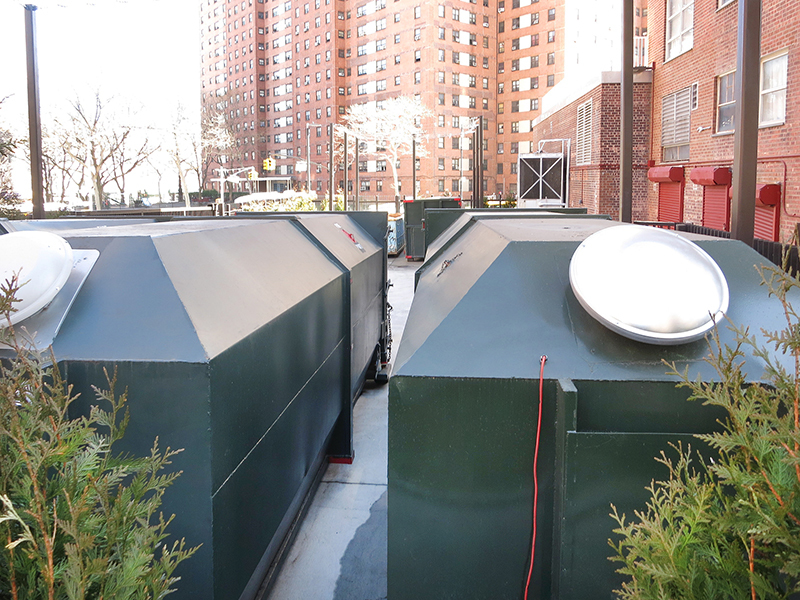 Prior to the renovation, the refuse collection area was unsightly, with storage sheds that served as temporary holding areas for garbage bags without any permanent containers. It had an unappealing perimeter chain-link fence and an uneven and deteriorating asphalt surface that led to a drainage problem. Pools of water polluted with refuse would accumulate after it had rained. It was not only unattractive to those passing by at the ground level, at LaSalle St., but from the apartments located in the adjacent residential towers above. “Our architectural team created a new refuse area that is architecturally attractive from both the street level and the apartments above. The new design also alleviated traffic problems brought about by the former inefficient layout,” said CTA principal Douglas Cutsoegeorge, AIA. Due to the inefficient layout, access to the area was difficult when garbage trucks would arrive to collect the refuse. The trucks would have difficulty maneuvering inside the trash storage area and would block access to tenant parking. Further, the site is adjacent to a supermarket located within Morningside Gardens. The area serves as an access point to the supermarket’s loading docks, complicating the traffic issues. CTA’s renovation alleviated the traffic problems, providing access to the new refuse containers and store loading docks, all while improving the aesthetics of the area from the ground level and above. DJM NYC LLC was the general contractor for the project. Galli Engineering, P.C. was the structural, civil, plumbing, and electrical engineer. 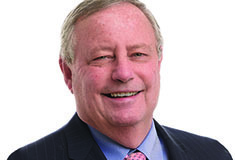 Richie Cabo, Horticulturalist served as the landscape and horticultural consultant. Domingo Gonzales Associates developed the lighting master plan for the entire co-op complex, elements of which were incorporated into the refuse area. Based on these conversations, CTA analyzed several options for containing the rubbish. One idea was to install large refuse compactors. However, it was found that the compactors would require a significant footprint as well as additional space for access, which would limit the number of compactor units that could be installed at the site. Ultimately, the solution was to install three large enclosed steel containers on the west side of the site and one container and an open dumpster on the east side. The new equipment includes one 30-cubic yard dumpster and four closed 40-cubic yard vermin resistant refuse bag storage containers supplied by ACA Waste Services, Inc. The team also specified an area for compositing bins and pre-sorted recyclables along the north perimeter of the area for textiles, glass, and paper. CTA also prepared for possible new e-recycling regulations by planning for access to a storage facility that may be used for that purpose, as e-recycling containers would need to be protected from the elements. All containers were arranged so as to allow for ADA-compliant wheelchair access. In addition, new yard hydrants on the east and west ends allow maintenance and cleaning crews to wash the containers and concrete slab with water. Site work included removing two existing damaged and diseased trees and stripping the existing asphalt and installing a new one-foot-deep concrete slab that incorporates electrical conduits and a drainage system. The new electrical system is located within the concrete slab’s conduits, providing electricity not only for the current equipment but, potentially, for future compactors should MHHC decide to install them at some point. The electrical system powers olfactory controls and ventilation systems in the garbage containers. The drainage system includes trench drains on the north and east sides, which are at the lower elevation of the sloping site. In addition, there is a trench drain along the outside perimeter of the west side’s wall, to control water approaching the site from the adjacent parking lot and other areas with higher elevations. The design team specified 290 linear feet of concrete planters on three sides of the area along the perimeter. The planters are independent structures with their own concrete footings and are, on average, five feet deep and five feet wide. They have drainage pipes connected to the city’s storm system. The horticultural consultant designed a sustainable urban organic garden for the planters. The outside walls of planters create a continuous wall around the perimeter of the site. They are custom-built concrete structures with brick facing on the outside that matches the brick used on the six residential towers’ facades. The brick wall is at least five feet high, but varies with the sloping grade. CTA specified a vertical “blade”-type fence, which is installed above the brick-faced wall. It is stainless steel painted dark brown and goes around the perimeter of the refuse area. The fence partially obstructs views into the trash area, which is visible only from certain angles, but does so without creating a solid wall. One of the most interesting features of the new refuse area are two custom-designed pergolas. According to CTA’s Designer and Construction Administrator, Ana Ribeiro, the CTA team developed the lightweight movable pergola system that can be easily removed if necessary. “We did this to improve the aesthetics from above,” Ribeiro stated. “Each pergola consists of seven steel posts, each 20 feet high. They are bolted into the concrete slab to conceal the storage areas from above.” There is one on the west end and one on the east end in the areas around the steel refuse containers. The west side pergola is 25 feet wide by 31 feet long, while the east side pergola is 25 feet by 22 feet. 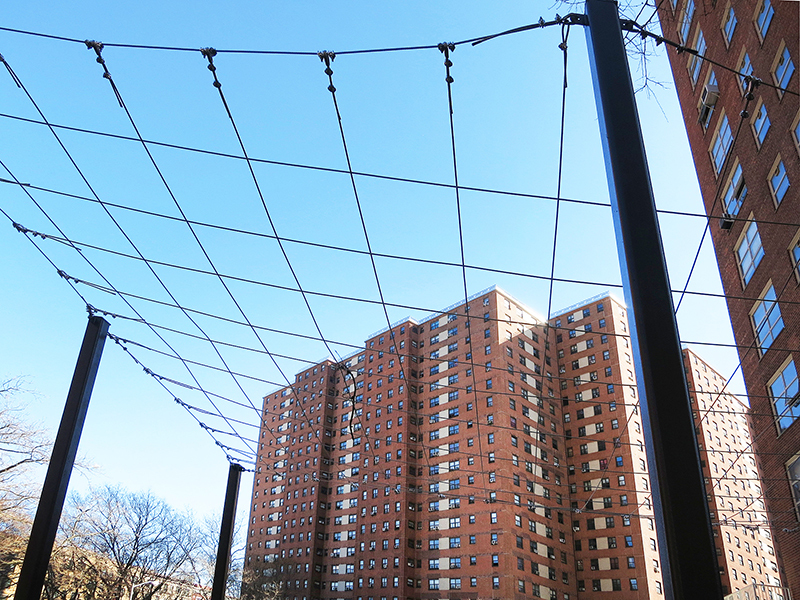 The tops of the pergolas were designed as a steel cable mesh with a two-by-two-foot square grid with steel ropes clamped in two-foot intervals. The mesh is connected to the top of the posts. The team used 316 grade stainless steel cabling, ½” x 3/8” diameter by Swing Staging Corporation. Both the mesh and the posts can be removed easily if larger storage containers need to be installed in the future. The pergola system was designed so as not to obstruct the ADA access to the containers and composting bins. The landscaping team will plant a fast-growing, blooming vine species native to New York State to climb the pergolas and obstruct the views of the trash storage areas. The main access sliding gate for trucks and deliveries is motorized. It is located in the center of the north side. A smaller pedestrian access gate is on the west side. The pedestrian and motorized gates were produced by City Gates. To accommodate the overall lighting master plan, CTA included two lampposts on the corners inside the planters. The lampposts each have their own footings and go through the planters into the ground.